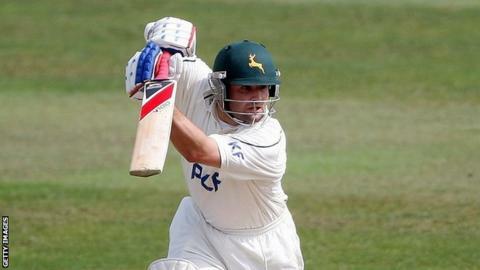 Nottinghamshire batsmen Karl Turner and Scott Elstone have been released. Notts academy product Elstone, 22, has struggled to win a place in the one-day team at Trent Bridge. Turner, 24, joined on a one-year deal at the end of last season but failed to establish himself in the side. "We hoped that Karl might challenge for a place in the opening partnership and he showed some positive signs without ever really nailing the spot," said director of cricket Mick Newell. "Riki Wessels and Alex Hales have taken those places now and so we couldn't see him figuring in our plans next season." Turner scored 227 runs in nine first-class innings for Nottinghamshire. Newell added: "Scott has found his way into our limited overs teams blocked by other players. "He has shown promise when he's had opportunities and I sincerely hope that he can find a future in the game because he's a great lad who fitted into the dressing room extremely well."